In his review of the Artistic Audio Vacuum Reference interconnects, Srajan admitted to the challenge of reviewing cables. He explained why the more seasoned reviewers would rather describe anything but the sonic characteristics of cables. Give 'em to the new guy, indeed! Theoretically, cables shouldn't make any difference, have zero effect on the sound - other than getting out of the way so the "heavy" equipment can deliver the music. Right? And yet, there appears to be a baby boom in power cable designs. With over a hundred different high-end cable manufacturers vying for your attention and wallet, most of these companies have multiple power cable designs to choose from. Ah, yes, another upgrade path - pay them now and pay them later. 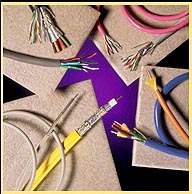 Some cable designs are completely original, from the conductors, connectors, insulation and shielding to whatever else can be thrown into a 6' copper rope. 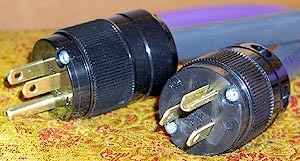 Then there are designs that focus solely on the cable itself and leave the connector designs to the best available off-the-shelf sources. Lastly, some cables appear to be assembled from the best available vendor parts, mixed and matched to offer a new power cable -- any power cable -- to a willing audience. In my estimation, whichever power cable you choose will condition the sound in its own way, whether actively, passively, or through sheer voodoo magic. This includes power cables that aren't specifically cited for their power conditioning abilities. Like different hair conditioners, different cables can either make your equipment sound frizzy (too little conditioning), plastiky (unnatural conditioning), flat (too much conditioning), or smooth and silky if you're lucky. How will a new set of inexpensive power cables affect the sound of your system? I can only suggest such personal results based upon my own experience. about University of Michigan football. I was thrilled when Srajan suggested I contact Mark Markel of Analysis Plus in Flushing, Michigan to find out about the new Power Oval 10 power cables. 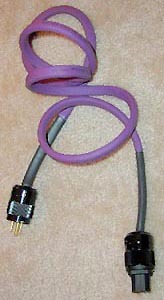 You see, I already own two sets of go-go purple cables in my system (Oval 12 loudspeaker cables and Oval One interconnects), so I am familiar with how Analysis Plus products get out of the way of the music. The thought of a complete set of matching purple cables was very tempting! Visual aesthetics are important, especially if the back of your equipment rack is starting to look like a floating bed of kelp. After gleefully slashing the heat-sealed plastic baggies off the cables, I was immediately surprised by how incredibly flexible these are! Remember the lingam-cables described in my previous power cable review? Well, the adjectives "supple" and "drape-like" definitely apply here. My first impression of the Oval 10? It looked like a squished purple garden hose with a male WattGate connector on one end and a female Marinco connector on the other. And, not unlike a brand new garden hose, the Oval 10 cables took a good two weeks to lose the raw rubber smell. I'm sure that the fresh-off-the-manufacturing-floor smell is fine for most audiophiles. After all, what's a new car without the new car smell? However, if the cables are good enough, why not add some cedar shavings to the packing materials? I for one would be thrilled if Odor Eaters were dropped in the plastic baggies with the cables. Because the Oval 10s are, um, ovoid, I noticed that the connectors of my two cables were not attached in exactly the same way. Everything was secure, but the oval cable on one connector appeared to be at a right angle when compared to the oval cable on the other connector. When I contacted Mark Markel, he assured me that the performance would be the same, even though the cables appeared slightly different. My listening experiences confirmed Mark's statement. The conductor on the Oval 10 is a low inductance, 10 gauge, UL approved CL2 copper rated to handle 600 Volts of current. The cable applies Analysis Plus' patented hollow oval design to reduce noise, resulting in quieter backgrounds for your music. The shielding is made up of silver-plated copper in an open braid to keep out high-frequency interference. 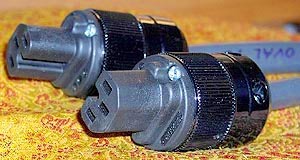 The cable is terminated with a WattGate 320 IEC and Marinco 5266 connector. While substantial, the Oval 10 isn't so massive that it would drag your equipment off the shelf. Rather, it's more than flexible enough to successfully maneuver through the tight corners that some equipment is forced into. The Oval 10 costs an affordable $199 for a 6' length and you can order shorter lengths for less. If you're interested in upgrading at a later date, a 6' length of the higher-priced Power Oval will set you back an additional $132 or $262, depending on the type of connectors you choose. I got it ... I got it ... I ain't got it. I love breaking in new stuff (please read with mild sarcasm). Endless hours of ocean surf, Italian House, piano trios, and period-performance choral music. Analysis Plus recommends 300 hours to properly burn in a power cable. I could drive cross-country in 300 hours! Well, maybe not in the ol' Taurus, but I'm sure I could have my car towed cross-country in 300 hours. As the cables were warming up over the next several weeks, I would periodically check in and listen. I even sat through a few non-critical listening sessions. Still, things just weren't quite sounding together. The backgrounds were quiet, but my system sounded pale and wan, as if it had a bad cold. What a revoltin' development! And then one day, after the 300th hour ticked past . . .